What is an original ? Good political cartoons are rather rare, most are "cheap’ in content and drawing. 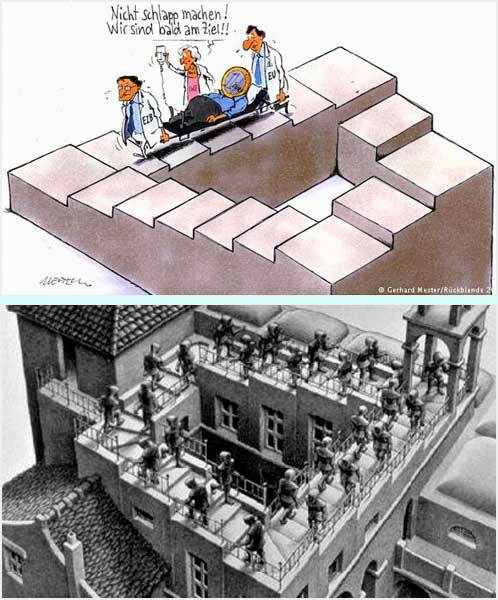 I like one on the right (top image) by the German illustrator Gerhard Mester: The euro is ill. Doctors and nurses are carrying it up the stairs on a stretcher and IV tubes are hanging from the weak European currency as it fights for its life. "Don't give up; we're nearly there", says the nurse. But the stairs go round and round without actually getting higher, so the euro will never make much progress. The cartoon was awarded Rückblende 2012 first prize, Germany's most important award for political cartoons. Rightly so. It’s a timely and high quality political cartoon in content and drawing. But don’t ask if is original because very likely we wont agree what is the meaning of ‘original’. That euro is ill - it has been said by thousands. And the drawing itself reminds you - I’m sure - on one of M.C. Esher’s "impossible graphics", the stairs you climb up into their low beginning (on the right, lower image). The cartoon is original, I would say, nevertheless. If you place your own, ‘original", phrase on the web, a good search engine will find the same phrase uploaded by someone among over a billion people on the web, I’m sure. And if we go to elaborate this more deeply, we run into the copyright legacy on the web. Not this week, however, not me.